These pieces by British artist William Roberts (No, not Rick Ross, different artist) just struck me as note-worthy. The one on the left is entitled Combat, 1915 and on the right is Les Routiers, 1931. Roberts being a Cubist often distorted figures into complex compositions. 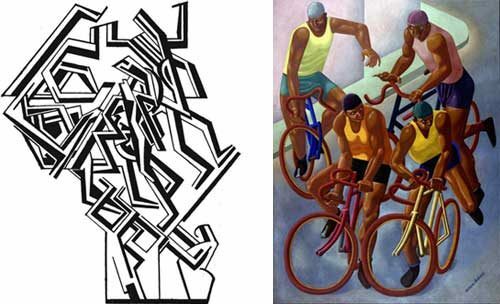 These two pieces are so similar that they made me think of how everyday as cyclists, we’re in combat with other elements. Wear your helmet and be safe out there.